From left: Olivia Piatkowski, Ophir Rotem, Dr. Sean Limon, Victoria Eidson and Cathleen Maluda. 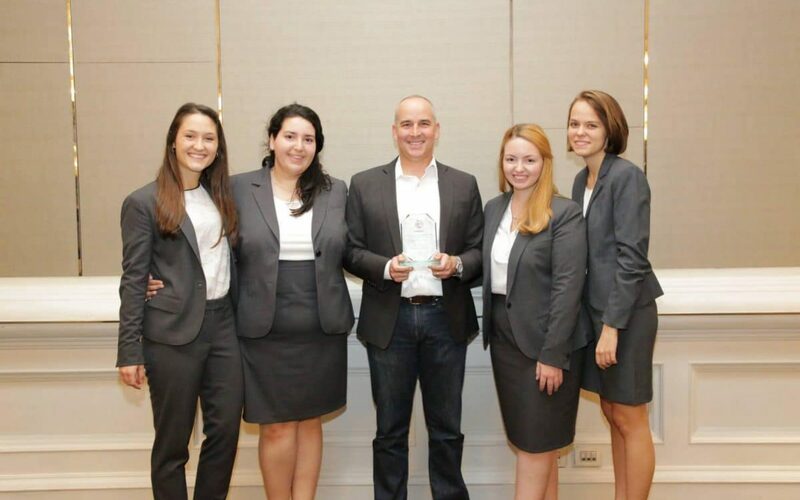 GAINESVILLE, Fla. – A team of four Heavener School of Business students took first place at the Thammasat Undergraduate Business Challenge (TUBC) in Bangkok, Thailand this October. Cathleen Maluda (BSBA Finance ’19), Olivia Piatkowski (BSBA Finance ’18, MSF ’19), Ophir Rotem (BSBA Marketing ’19) and Victoria Eidson (BSBA Marketing, MIB ’19) outperformed 19 teams from some of the top business schools around the world including University of California – Berkeley, University of Southern California Marshall School of Business, Canada’s Queen’s University, Australia’s Queensland University of Technology, Denmark’s Copenhagen Business School and National University of Singapore, among others. The Thammasat Undergraduate Business Challenge is an international business case competition bringing together undergraduate students from leading business schools around the world. The competition is annually hosted in Thailand by the undergraduate students of Thammasat University’s BBA international program. Each year, representatives from leading business schools are invited to join the competition. The case, which is written based on real issues regarding a specified business, is given to the teams to analyze and present their solutions to a panel of judges. To secure the win, the team gave a 20-minute presentation about omni-channel services that integrate physical and digital channels to provide a consistent customer experience. The key to the team’s success was understanding the Thai market and doing prior research on the case company. The team took home a trophy and secured the Heavener School of Business an invitation to the Champions Trophy Case Competition in Auckland, New Zealand in early 2019. Only universities that win first place in one of the top 12 international case competitions, like TUBC, are invited to this prestigious competition. “Case competitions are an opportunity to experience a tremendous amount of personal and professional growth,” Piatkowski said. “Conducting market research in Thailand taught us about the global economy and consumer cultures abroad. Working on a team for 32 hours with minimal sleep builds leadership, teamwork, perseverance and camaraderie.